You don't have to constantly switch between windows now! 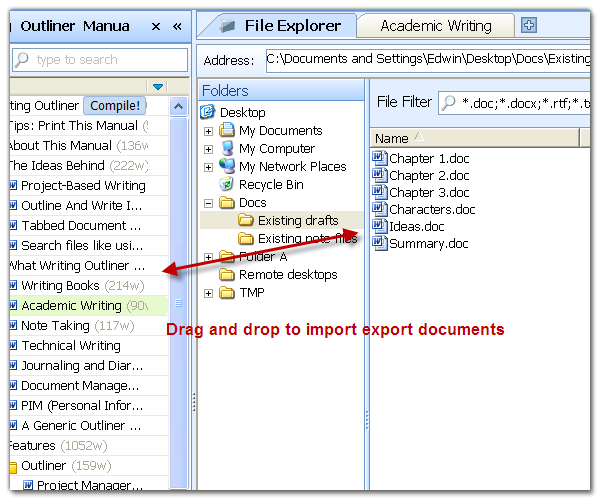 Writing Outliner provides a full-featured "Windows Explorer" like component, called "File Explorer", which can be opened as a tab in the main area of the Word window. This allows you to use use drag and drop to easily import your existing documents to a writing project, you can also export documents from a writing project to your computer, without having to switch between windows.